So we are still stuck around the house from all the bad weather. We have had a lot of game nights and movie nights in the last 10 days. They have been a lot of fun, so I thought I would put together a look to wear to game night. Granted if it's just the family at game night or movie night, I dress a little more casual in sweatpants or pjs depending on how late we start. If I were going over to a friends house or having friends over though I would dress a little nicer but still casual. 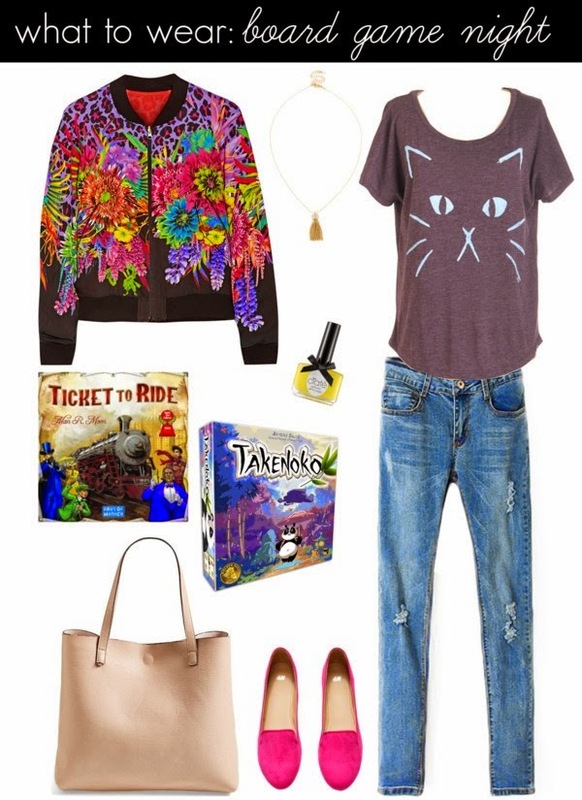 So for me a game night look would definitely embody comfy jeans and a tee. The colorful jacket just screams fun to me just like a game night should be. And of course you need a tote bag so that you can carry a few of your favorite games with you when you go out for game night. What would you wear to game night? Aw, I love this! You've inspired me to host a game night :) Hope you're having a great week! That printed bomber is CRAZY- in the best way! That cat tee is so cute! That cat shirt is just too adorable!!! Ticket to Ride is one of my favorites! Also, I would buy that cat shirt in every color if I could!